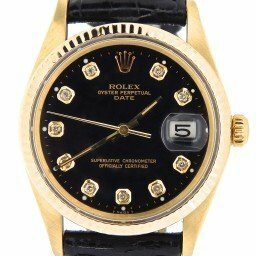 This is a great choice for a slightly smaller solid gold Rolex dress watch. 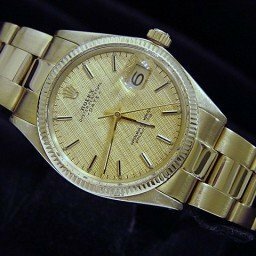 No doubt, the mens yellow gold Rolex Date is one worth checking out. 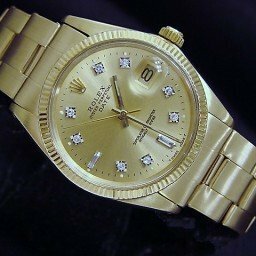 We are confident that you find the perfect version to suit your taste and budget. 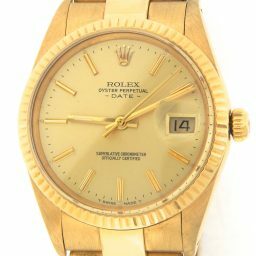 Our selection offers Rolex Date mens yellow gold watches with colorful watch faces such as champagne dials, black dials, blue dials, and more. 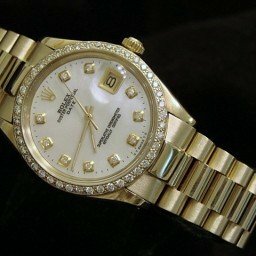 In addition, these come in a variety of bezels and band options that make these watches truly breathtaking.  As an additional benefit, we offer a 30-day money-back guarantee with each purchase, as well as free U.S. shipping and available financing. 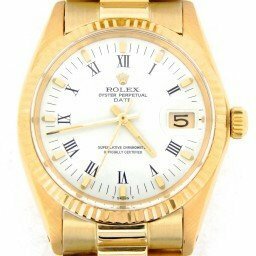 Also, our qualified customers enjoy our Lifetime Trade-Up Guarantee for added value. 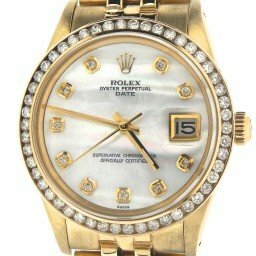 Keep in mind, we offer personalized customer service. 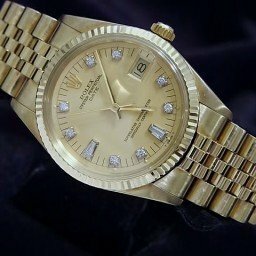 So, please contact us if we an help you find your perfect gold watch. 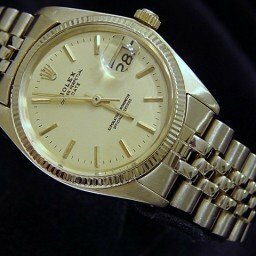 Although it’s standard today for all Rolex gold watches to be fashioned from 18k gold, this wasn’t always the case. 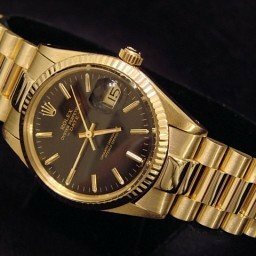 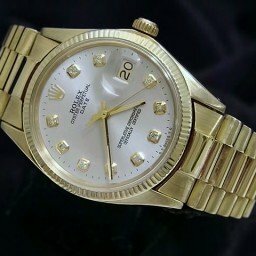 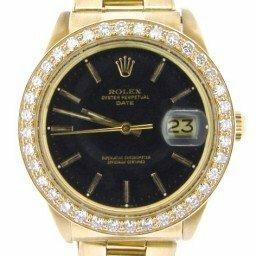 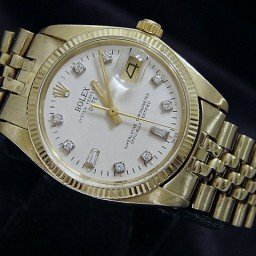 If you look a little further back in Rolex’s catalog, late 1980s and before, there are some examples of 14k yellow gold Rolex watches. 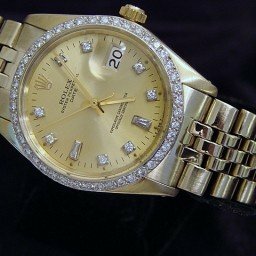 Take for instance the yellow gold men’s Date Rolex watch—there are models in both 14k and 18k yellow gold. 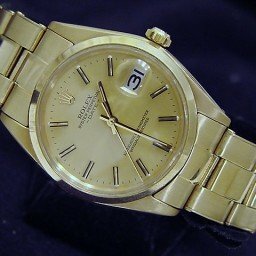 What’s the benefit of the 14k gold models you ask? 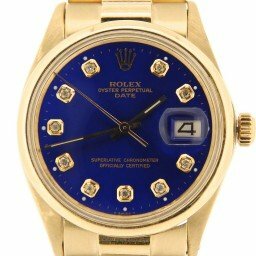 Well, it’s a great way to sport a yellow gold Rolex watch at a more affordable price point. 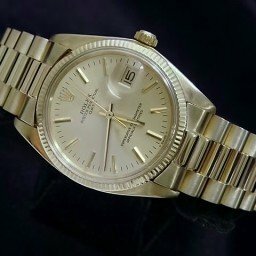 Let’s find out more. 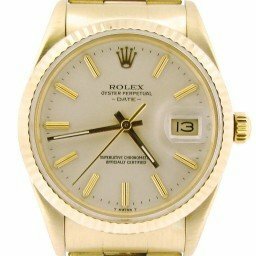 The men’s yellow gold Date watch includes a 34mm Oyster case, water resistant to 100 meters (330 feet). 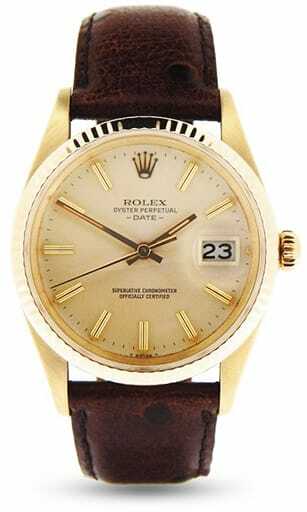 Furthermore, as the name of the model implies, it features a date window on the dial. 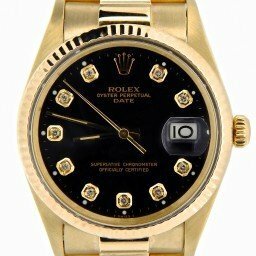 Plus, similar to most Rolex watches with date functionality, it also has a magnification lens on the crystal above it, dubbed the Cyclops. 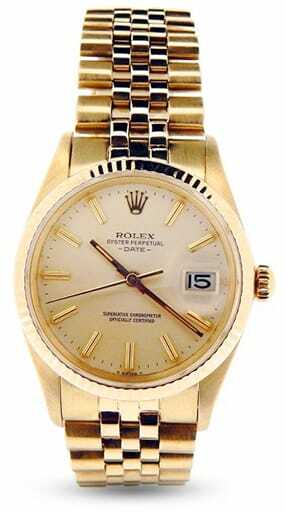 Another important trait to take note of on the Date watch is that it runs on an automatic mechanical movement. 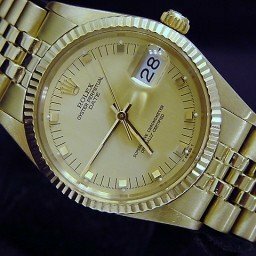 In terms of variation, there are different bracelet, dial, and bezel options to choose from within the yellow gold men’s Date collection. 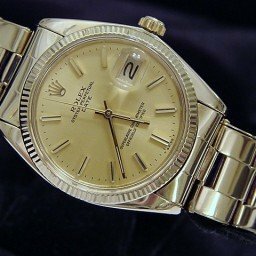 There are smooth bezels, fluted bezels, and engine-turned bezels. 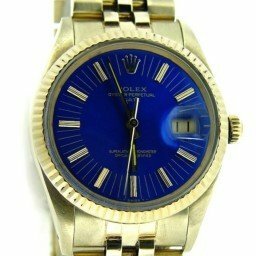 There are the standard Oyster bracelets or Jubilee bracelets, in addition to after-market custom leather or even custom President-style bracelets too. 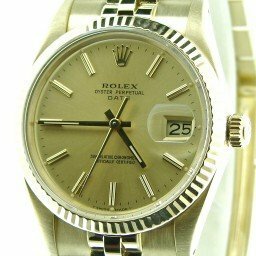 And in true Rolex fashion, dial options are plentiful. 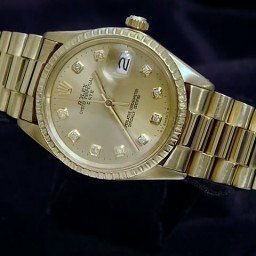 As mentioned, the gold used to construct the men’s yellow gold Date can either be 14k gold or 18k gold, with the latter being slightly richer in color. 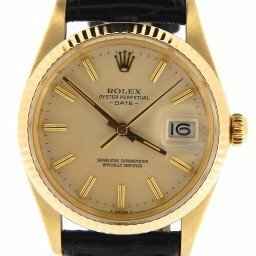 As expected, the yellow gold men’s Date watch has evolved since its inception in the 1950s until it was eventually discontinued in early 2000s. 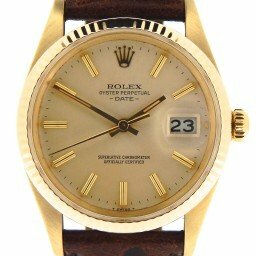 Early examples from the 1960s and 1970 include the ref. 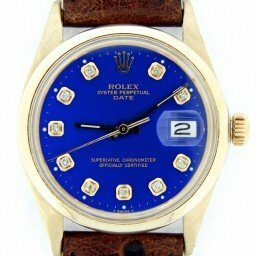 15xx reference numbers. 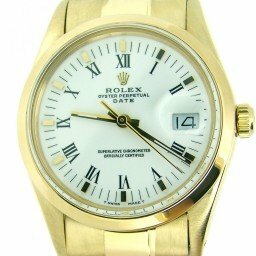 These particular models come equipped with non-quickset automatic movements, which means the date must be set by adjusting the center timekeeping hands accordingly. 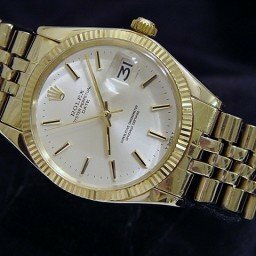 However, like most Rolex movements, these are COSC-certified watches held to extremely high standards of accuracy. 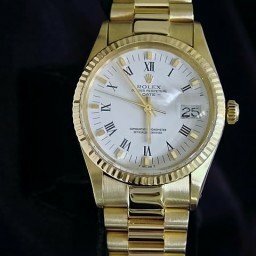 Furthermore, as vintage Rolex watches, the yellow gold men’s Date ref. 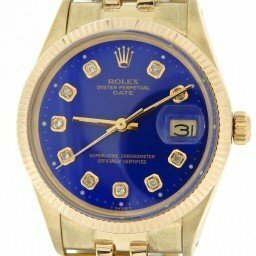 15xx watches have acrylic crystals above the dials. 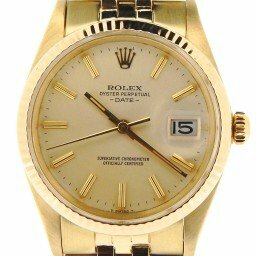 In 1977, Rolex introduced the Caliber 3035 automatic movement to include the practical quickset feature, meaning that users could now adjust the date independently from the center hands. 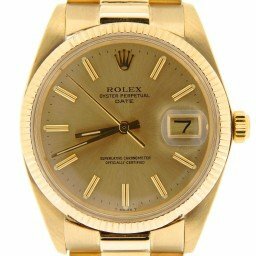 As a result, the yellow gold men’s Date collection was updated to include this new movement and carried the five-digit reference numbers, ref. 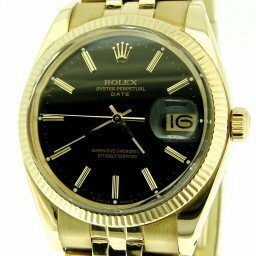 150xx. 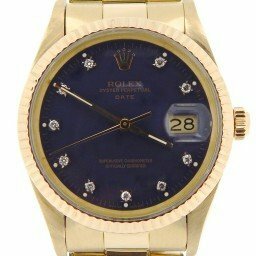 These Date models still include the acrylic crystals. 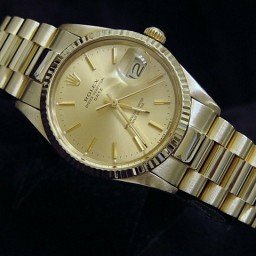 A decade later in 1988, Rolex unveiled the now famous Caliber 3135 automatic movement with enhanced durability and precision. 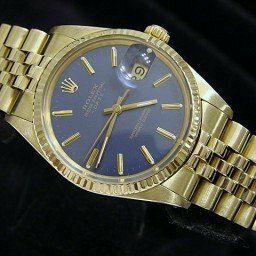 Therefore, the company began equipping the yellow gold men’s Date watches with the new movement and assigned them with reference numbers ref. 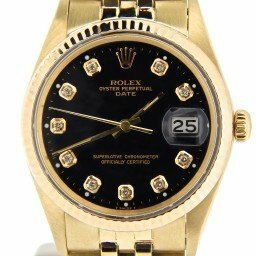 152xx. 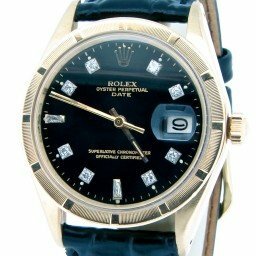 This time, to accompany the modern movement, the dials were protected with new scratch-resistant sapphire crystal too. 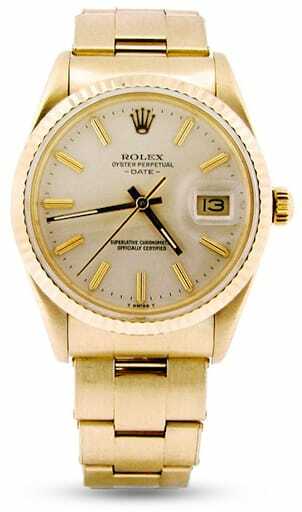 It’s also worth mentioning that while earlier models offered 14k and 18k versions, the yellow gold Date ref. 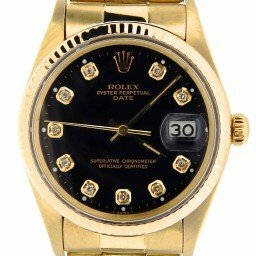 152xx models were only available in 18k gold. 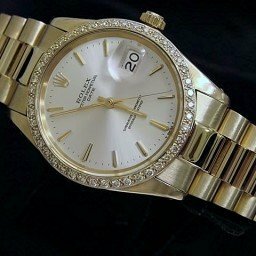 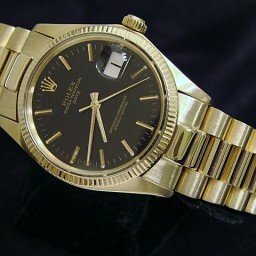 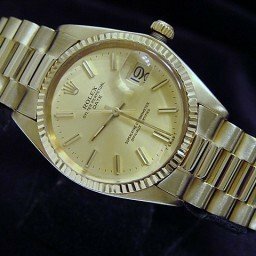 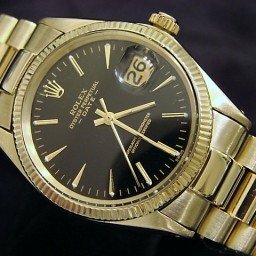 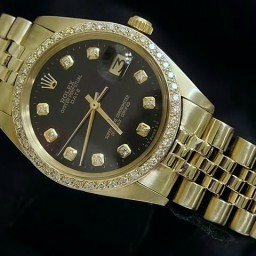 Rolex eventually discontinued the yellow gold versions of the Date watch in the early 2000s and continues to only make stainless steel editions of the Date today. 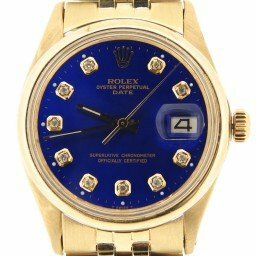 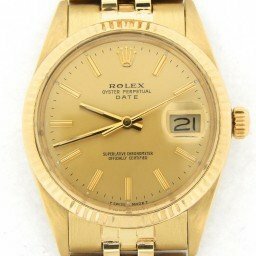 So if you’re looking to source a yellow gold men’s Date watch, then turn to the secondary market. 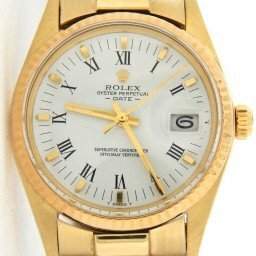 Here you’ll find pieces starting as low as $3,700 for vintage models on leather straps up to about $12,000 for the newest iteration in solid 18k yellow gold.